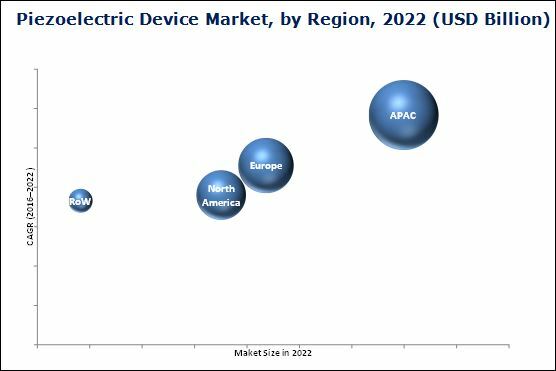 [169 Pages Report] The piezoelectric device market is a mature market with applications ranging from industrial machinery to compact electronic equipment and tools such as digital cameras, phones, and medical instruments. The base year considered for this research study is 2015 and the market size has been estimated for the period between 2016 and 2022. The overall piezoelectric device market is expected to be valued at USD 31.33 Billion by 2022, growing at a CAGR of 4.88% between 2016 and 2022. To define, describe, and forecast the piezoelectric devices market segmented on the basis of material (piezocrystals, piezoceramics, piezopolymers, and piezocomposite), product (piezoelectric sensors, actuators, motors, transducers, generators, and other piezoelectric products), application (industrial and manufacturing, automotive, defense and aerospace, healthcare, information and communication, and other applications), and geography. To analyze the strategic developments such as joint ventures, mergers and acquisitions, new product developments, and research and development in the piezoelctric device market. 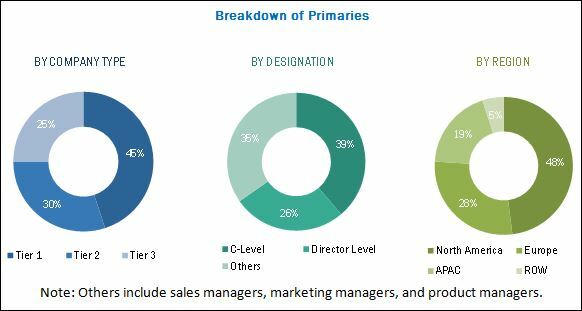 The research methodology used to estimate and forecast the piezoelectric device market begins with obtaining data on key vendor revenues through secondary research. Some of the secondary sources used in this research include information from various journals and databases such as IEEE journals, Factiva, Hoovers, and OneSource. The offerings, distribution channels, and the regional presence of these players have been understood through in-depth discussions. Additionally, top-down and bottom-up approaches were used to estimate the sizes of other individual markets by using percentage splits from secondary and primary research. The entire process includes the study of the annual and financial reports of the top market players and extensive interview of key insights from industry leaders, such as CEOs, VPs, directors, and marketing executives. The figure below shows the breakdown of the primaries involved in the research study on the basis of company, designation, and region. The piezoelectric device ecosystem comprises piezoelectric material providers such as APC International, Ltd. (U.S.), Morgan Advanced Materials (U.K.), and CeramTec GmbH (Germany), among others; components manufacturers such as Piezo Solutions (U.S.), piezosystem jena (Germany), Piezo Systems, Inc. (U.S.), Piezomechanik DR. Lutz Pickelmann GmbH (Germany), among others; technology providers such as Mad City Labs Inc. (U.S.), CTS Corporation (U.S.), and Aerotech Inc. (U.S.), among others; and system integrators such as Exelis (U.S.), and Physik Instrumente (PI) GmbH & Co. KG. (Germany), among others, who integrate these piezoelectric components and sell them to end users to cater to their unique business requirements. MarketsandMarkets forecasts the global piezoelectric device market to grow from USD 23.54 Billion in 2016 to USD 31.33 Billion by 2022, at a CAGR of 4.88% between 2016 and 2022. The increasing application areas for piezocomposite materials in industries and emerging energy harvesting techniques using nonconventional energy sources such as body and facial movements are creating a huge demand for the piezoelectric device market across the world. The major factors driving the growth of the piezoelectric device market include increasing use of piezoelectric devices for energy harvesting applications and increasing funding from government and other investors into the market. Furthermore, the rising automotive sector is expected to drive the market for piezoelectric motors and actuators in the coming years. The market for piezoceramics held the largest share in the piezoelectric device market owing to its high piezoelectric sensitivity and ability to acquire desired shapes and sizes. Currently, the most widely used piezoelectric ceramic material is lead-zirconate-titanate (PZT). It is used in a variety of applications such as healthcare, industrial and manufacturing, and automotive, among others. The global market for piezoelectric actuators and piezoelectric motors is expected to witness a significant growth during the forecast period owing to the benefits like reliability and cost-effectiveness offered by piezoelectric actuators and motors. Increase in demand for ultraprecision motion devices used for purposes such as manufacturing, structural health monitoring, and nondestructive testing and in industries such as automotive and consumer electronics is expected to boost the market during the forecast period. The market for piezoelectric actuators has potential of further development and growth in areas such as autofocus assemblies required in phone cameras, fuel injectors used in the automotive sector, and precision movement application in microelectronics production. Industrial and manufacturing application is the leading the piezoelectric device market on basis of application. Piezoelectric motors, sensors, actuators, and transducers have a number of important uses in industrial processes. Piezoelectric sensors such as ultrasonic sensors are used in sorting and material handling at various stages involved in manufacturing processes. A piezoelectric level sensor uses sound waves to detect and monitor the level of materials in a bin. This increases automation and accuracy and reduces material loss caused by human error. Actuators are used to precisely control industrial machining tools. The piezoelectric actuators, which use the piezoelectricity of crystals, have been used widely in high-precision positioning application in manufacturing and inspection equipment owing to their ability to control a mechanical displacement at a high speed. APAC held the highest share in the global piezoelectric device market in 2015. Japan is involved in the researches on piezoelectric materials to a greater extent than any other country. In recent years, Japan has attempted to apply the piezoelectric technology for microscale applications. These attempts include the usage of piezoelectric technology in floors of train stations to generate electricity. Owing to these researches, the market in APAC is expected to grow at the highest rate in the coming years. A high cost of material involved in manufacturing of piezoelectric products, high cost required for R&D activities related to manufacturing of piezoelectric products, and legal measures which restrict the use of lead in these products are the restraining factors for the market. 12.6 Physik Instrumente (PI) GmbH & Co. Kg. 12.10 Mad City Labs Inc.